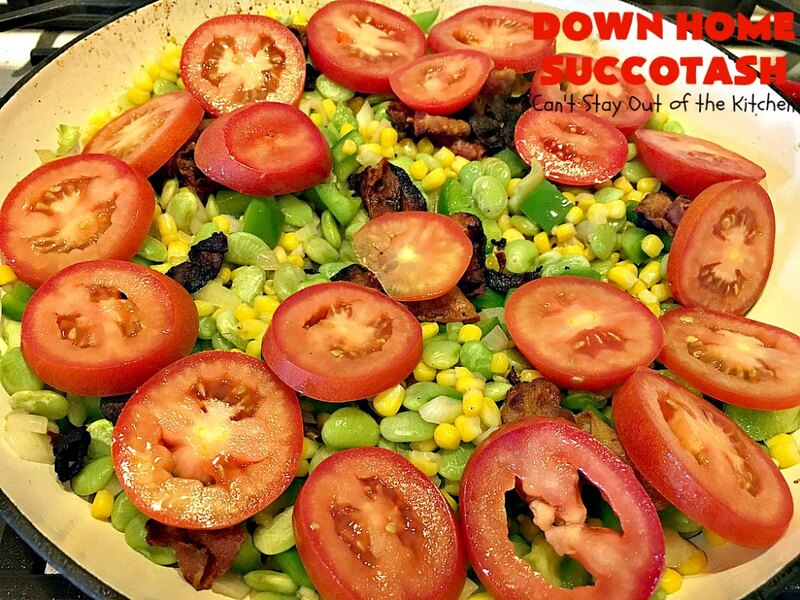 Down Home Succotash is such a fabulous recipe. It’s easy to put together, gluten free and even economical. One batch probably makes a good 10 servings. I love making succotash this way with lots of other goodies in it. This recipe includes corn, lima beans, onion, bell pepper, tomatoes and bacon. It doesn’t even call for seasoning because it’s mixed with the bacon grease which adds plenty of smoky flavor and seasoning to this down-home recipe. I have found so many wonderful recipes through Taste of Home over the years, and this one is no exception. 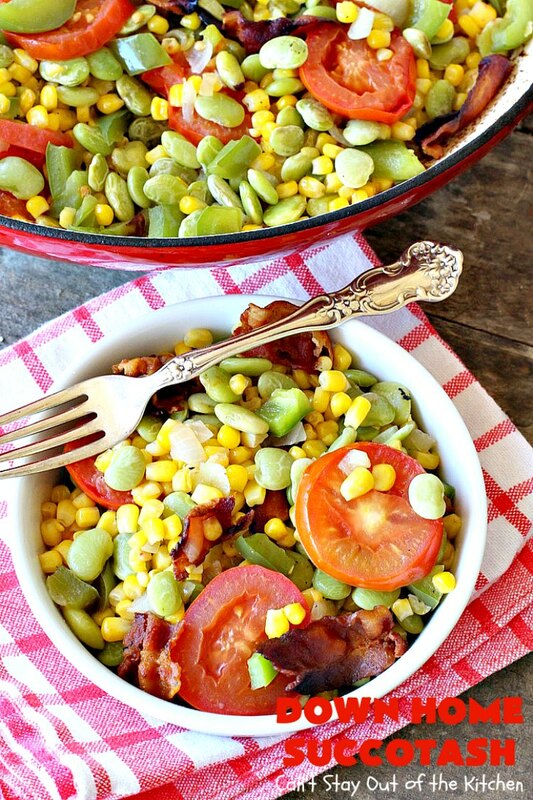 I always thought succotash was comprised solely of lima beans and corn. Not so! For those who aren’t normally lima bean lovers, this recipe may get you actually eating this very healthy vegetable. It is succulent and mouthwatering. While this recipe includes gluten free bacon, you can also use turkey bacon if you want a healthier recipe. I used to pour through my cookbooks twenty years ago when the Internet wasn’t available or as popular as it is today. I remember looking at this recipe and wanting to try it out. The first time I made it was for company soon after we joined Hillcrest Baptist Church, in Cedar Hill, Texas, circa 2000. We had a couple of families over and they loved this recipe. We did too. I decided then and there that Down Home Succotash would be on my menu regularly. Throughout the years, our family has always enjoyed eating this recipe. When I originally posted this recipe, first in June 2012, and then again in August 2012 (because I had to delete the first post because it was doing strange things to my blog), the pictures were really poor and grainy. You really couldn’t see the texture of this amazing side dish very well. In fact, the pictures weren’t just bad, they were embarrassing. So I recently remade this recipe (October 2014) for some folks in our Sunday school class. She was injured in a fall so she appreciated some home cooked meals for a few days. I retook the pictures and I believe they adequately convey the loveliness of this class recipe. 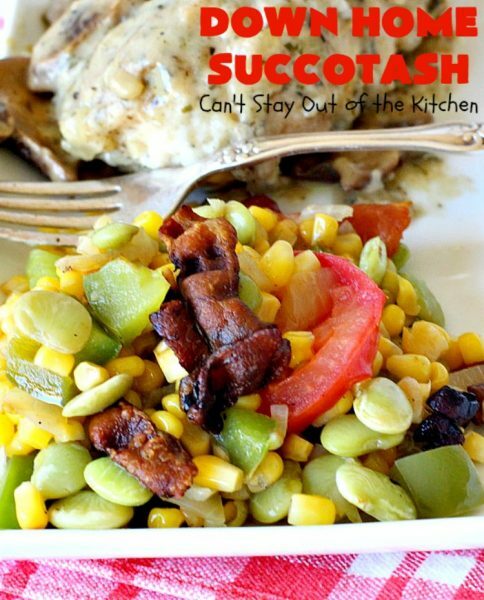 If succotash isn’t usually on your menu, I highly recommend you reconsider. The way I make it is delicious. I remade the recipe again (August 2018) for our Friday night care group. I served it with a Chicken and Mushroom Casserole. Both recipes were irresistible and snatched up heartily by our company. 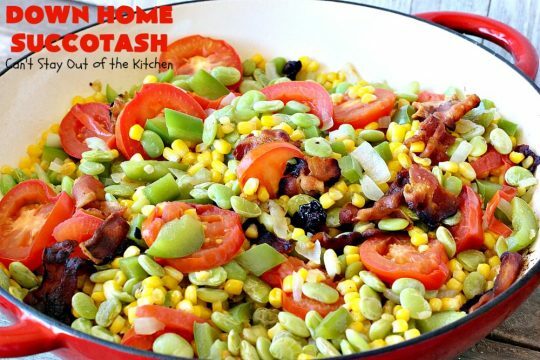 This is still my favorite way to enjoy succotash. I hope you give it a try. 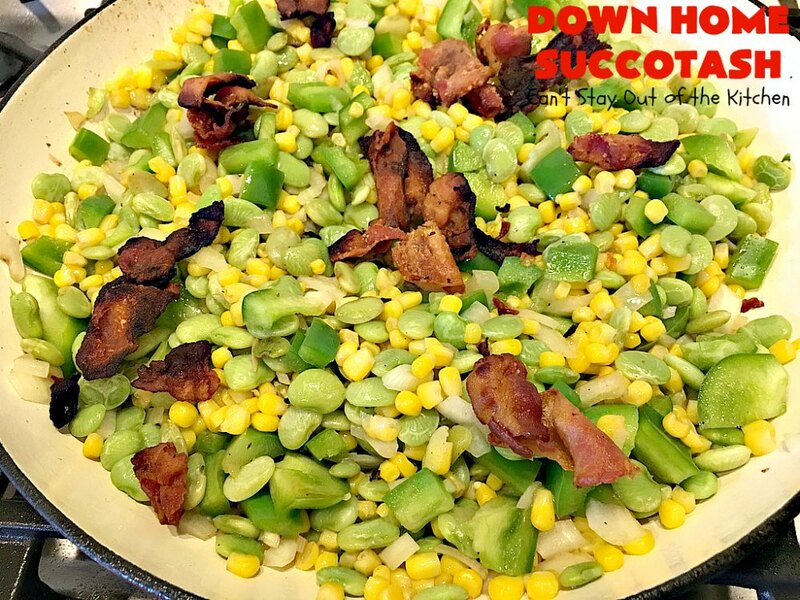 Down Home Succotash looks as good as it tastes. It does use bacon grease to fry the onions and peppers in but it gives this casserole a needed boost in flavor that butter or margarine won’t. 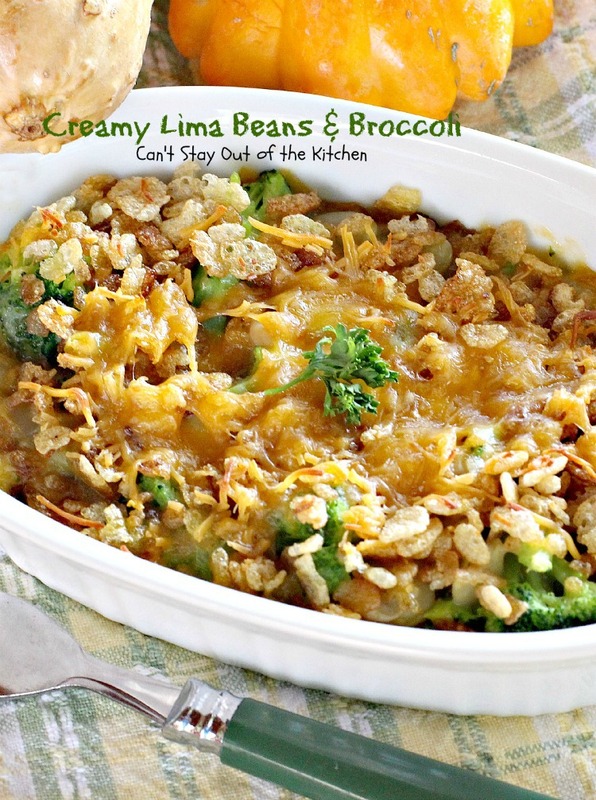 I have used canned veggies when I don’t have fresh or frozen, but I certainly like using frozen corn and lima beans rather than canned when possible. I also prefer using Roma tomatoes sliced about 1/2″ thick rather than wedging regular tomatoes. Roma tomatoes do not have quite the moisture and pulp of regular tomatoes. I use them almost exclusively now. 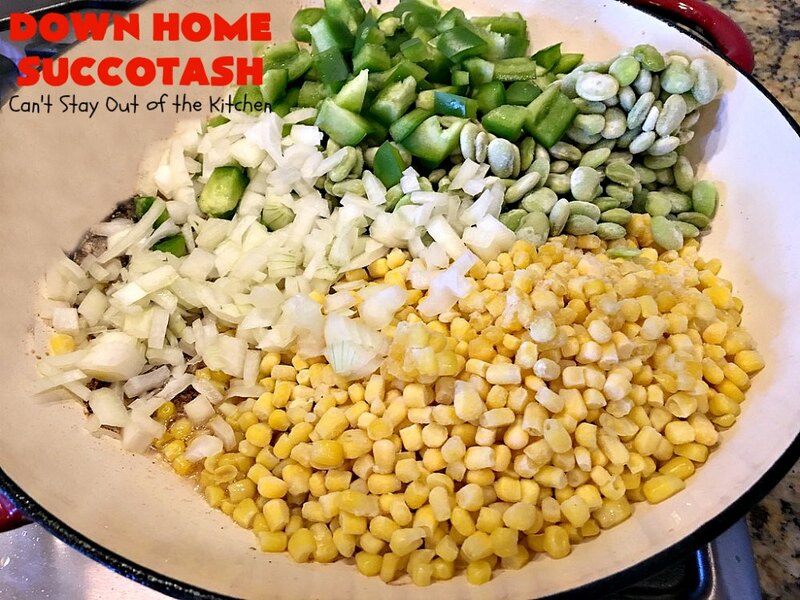 Down Home Succotash is pretty hearty and so easy to prepare. 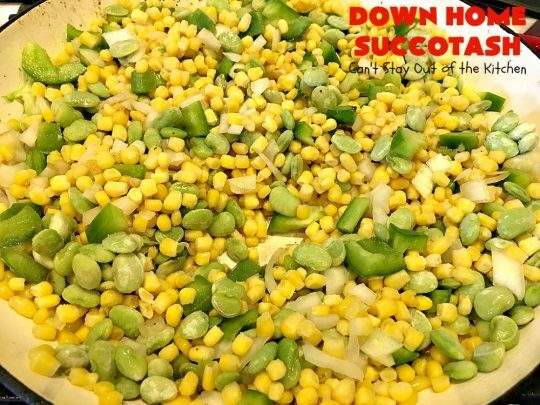 Every bite of Down Home Succotash is mouthwatering, succulent and delectable! I served it with Chicken and Mushroom Casserole. 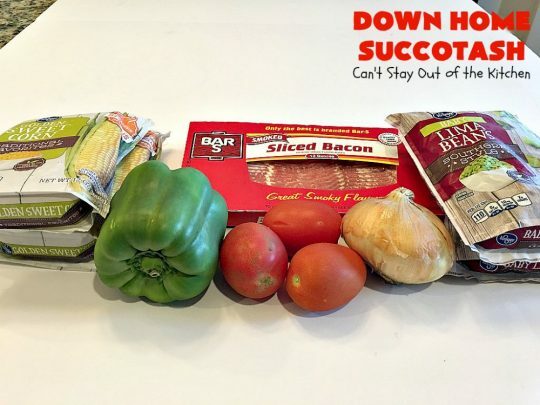 Down Home Succotash uses only six ingredients! Layer the bacon in the bottom of a Dutch oven or frying pan and fry until done. 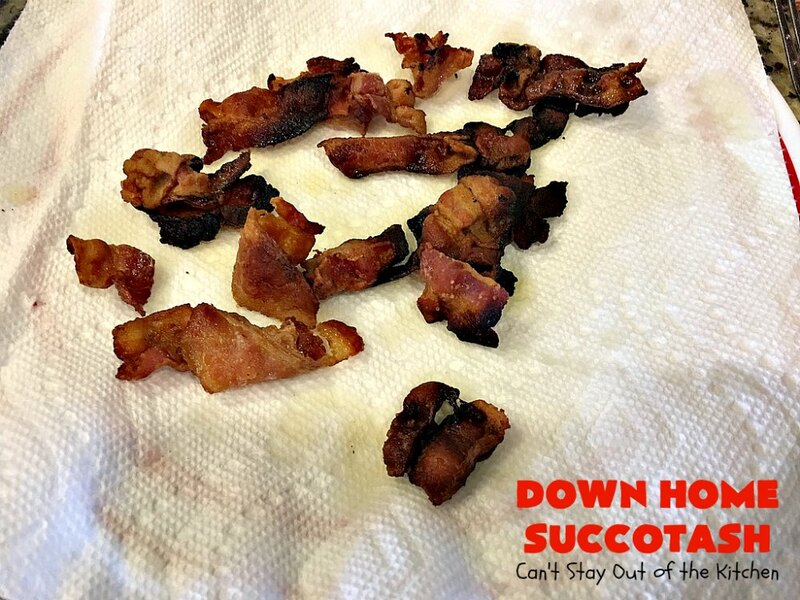 Remove bacon pieces to drain on paper towels. 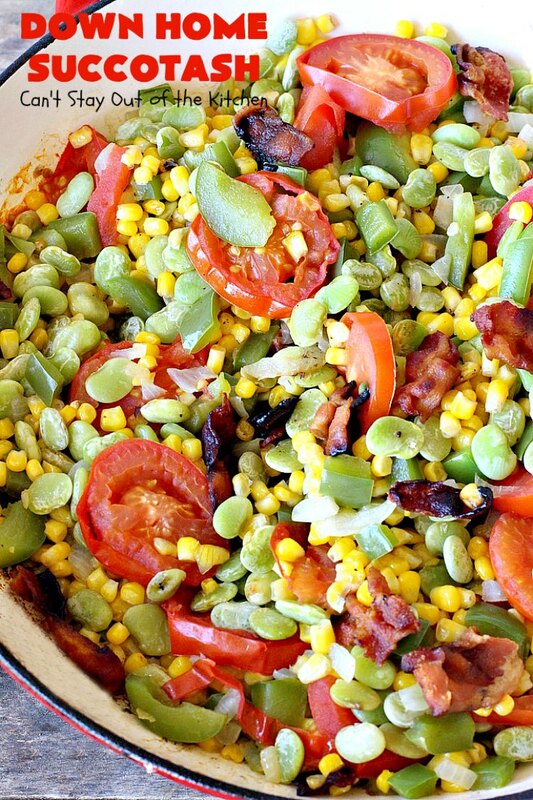 To bacon grease in skillet, add corn, lima beans, bell pepper and diced onion. Sauté veggies for about 10-15 minutes. You can season with salt and pepper if you desire. Continue stirring and cooking until the tomatoes are done–about 5-10 minutes. To serve: Spoon Down Home Succotash into bowls and garnish with additional salt and pepper if desired. Down Home Succotash is one of our favorite side dishes. It’s great for holiday dinners, too. 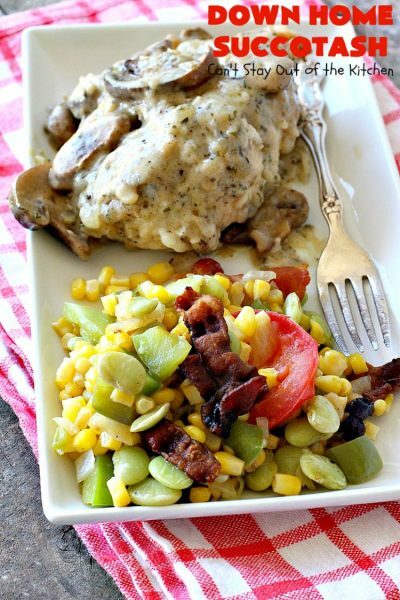 It’s wonderful with Chicken and Mushroom Casserole. This mouthwatering and succulent succotash recipe includes lima beans, corn, onion, bell pepper, bacon and tomatoes. It's quick and easy to make and so full of flavor because of the bacon. It's a great company or holiday side dish. Gluten free. In a skillet, cook bacon until crisp. Remove bacon to paper towels and drain. To drippings in skillet, add corn, lima beans, green pepper and onion. Simmer for 10-15 minutes or until vegetables are almost tender, adding water if necessary. Stir in tomatoes and bacon; cook just until tomatoes are heated through. Mouthwatering and succulent succotash recipe. 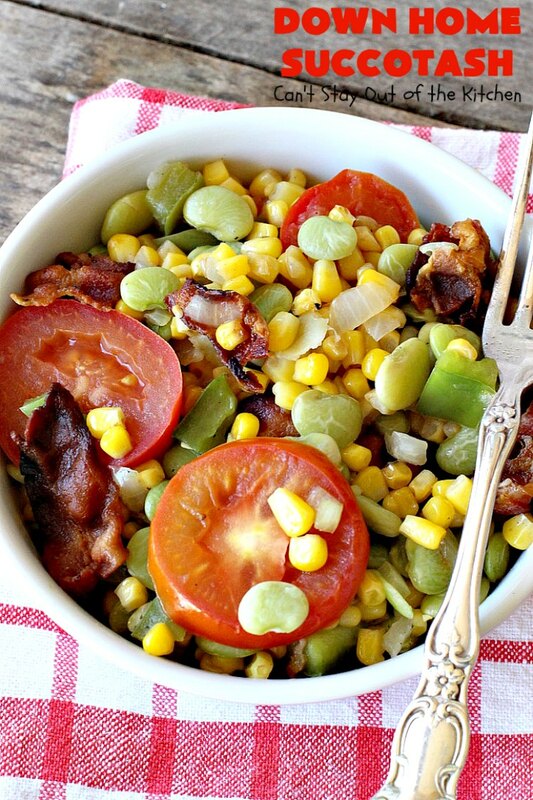 This one includes lima beans, corn, onion, bell pepper, bacon and tomatoes. Great holiday side dish. To drippings in skillet, add corn, beans, green pepper and onion. 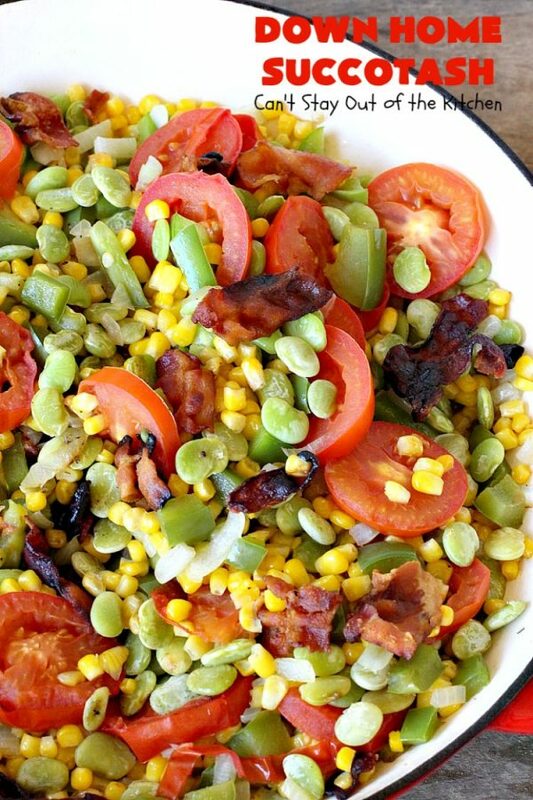 Bacon adds a rich, savory flavor to this succotash recipe. 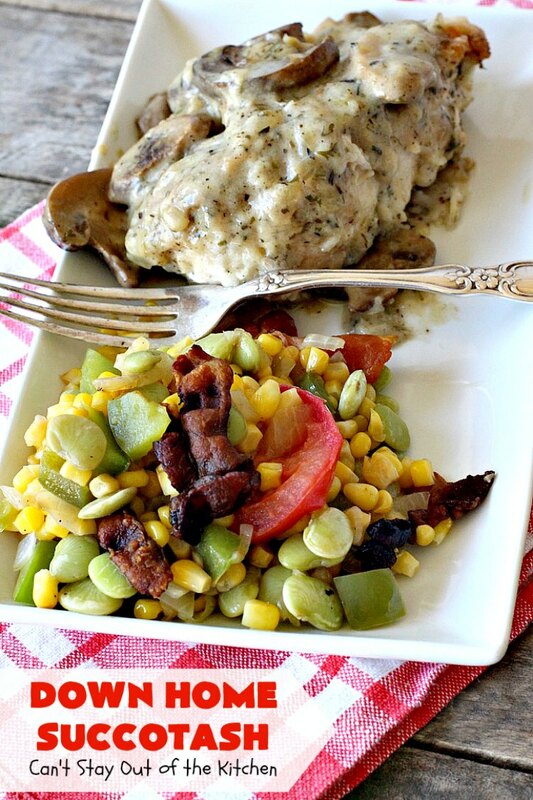 Down Home Succotash is a great accompaniment to chicken entrees. This dish is so hearty it can almost be a meal in itself, especially if you add biscuits, cornbread or rolls. It really is very tasty and quite easy to prepare.